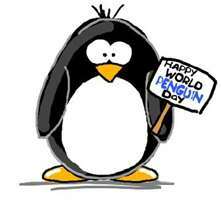 MAD Family Fun: TODAY (April 25th) is World Penguin Day!!! Well the word on the street, or, um, I mean ice, is that today marks the start of the Adelie penguins’ migration northward into the surrounding Antarctic seas. Umm, did someone tell them that today and today only, was the day to do this!?!?! I am sure it is AROUND this time of year that they start to migrate. But who cares, right? Lets have some penguin fun today on World Penguin Day!! Here is a great site called Penguinscience! They have all sorts of great stuff on penguins like information on adaptation, a classroom power point your kids can watch, and more. And KidZone has everything you need to learn about and have fun with penguins. They have songs/poems, worksheets, make a book, coloring sheets, mazes, ahhh the list just goes on and on! And here is a video showing Adelie Penguins and encouraging girls in the area of science!